The HRGM was formed in 1998 and is committed to the presentation of living history. Members research life and activities of particular eras, recreating daily life as realistically as possible. This may be a typical day in the civilian population, or of a soldier in a military garrison, or a commemoration of a particular event in Malta’s rich history. 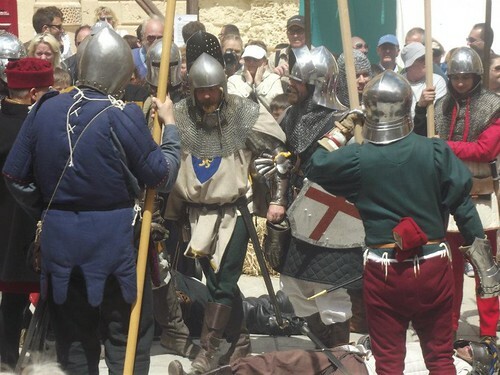 Living History provides an experience which brings to life contemporary accounts of the period and presented as a tangible experience for spectators. Members have formed representative military units of the troops from the Aragonese Crown Garrissons at Malta between the late 14th and mid 15th Century, regiments of the Knights of St. John during the late 18th Century, including the Regimento di Malta, the Cacciatori Maltesi and the Maltese Militia, the 19th demi-brigade of the line, a French unit which was stationed in Malta during the blockade, Marine Grenadiers off HMS Alexander, which was also stationed around Malta during the blockade (and was Captained by Capt. Alexander J. Ball, who eventually became the first British Governer of Malta), and units from the early 19th Century – the Maltese Light Infantry, the first Maltese corps of the British Army and a contingent of Royal Marines. The HRGM can also field a team of armed Maltese insurgents, as well as peasants, camp followers and other civilians from all eras portrayed.